I am a smoothie queen. When I started to eat according to the high-fat low carb way to help me to balance my blood sugar, I realised I had to give up the morning banana based smoothie ritual. I needed a high-fat low carb smoothie recipe and fast!! So, discovering I could substitute my morning banana based smoothie with pear has been a revelation. Pear is much lower in carbs and helps to keep our blood sugar steady. 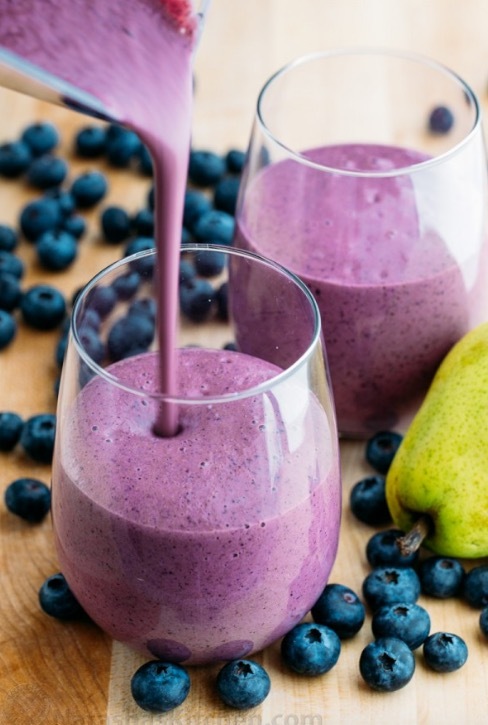 Try swapping the banana for a pear in your favourite smoothie recipes. Tropical fruits are higher in sugar so avoid them, berries and orchard fruits are fine. In general, food that is from a different climate zone will not serve you as well as food from your own climate zone. Local food is best, for so many reasons. You can add sweetness and good fats with coconut milk (from a tin and not so local I know!!). Include superfood powders like a teaspoon of maca, wheatgrass or spirulina to add more nutritional value. Enjoy!! The shake may contain more fat than you are used to. Healthy fats satisfy our craving for sweet carbohydrate-rich foods. Scientists are now realising that the low-fat diet was recommended due to politicians pushing to sell more grain, it was not based on sound science. This is a recipe is from a great book called Always Hungry. I recommend it if you are trying to lose weight or balance your blood sugar. It’s written by an enlightened endocrinologist who specialises in obesity.